Bring on the Heat Race Series presented by Saucony was developed to encourage and support summer races here in Wilmington. 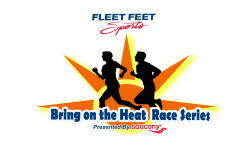 When the temperatures rise, we want to make sure you keep moving, so we have partnered up with 5 races over 3 months to create the Bring on the Heat Race Series presented by Saucony. Interested in participating? On race day, check in at the Fleet Feet tent to get credit for running!